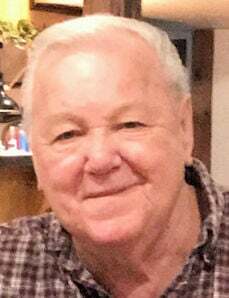 Ronald R. Palmer LATHAM, N.Y. — It is with the heaviest of hearts that the family of Ronald R. “Rocky” Palmer announces his entering into eternal life on Sunday, March 24, 2019. Ronald was at home surrounded by the love of his family. Born in Barre, Vermont, on April 2, 1941, Ronald was the son of the late Roy Palmer and Doris R. (Metivier) Palmer. Ronald relocated to New York as a young boy and resided there for much of his life. Ronald was a graduate of Watervliet High School where he played football. He served his country in the U.S. Navy onboard the USS Aeolus (ARC-3) and was honorably discharged on April 28, 1961. He was a retiree of the Ford Motor Co. in Green Island where he had worked for many years. Ronald was a member of the American Legion, the Shriners, the Free and Accepted Masons, the Ancient Order of Hibernians and formerly of the S.W. Pitts Hose Company in Latham. Ronald was hard working; he was a skilled carpenter, electrician and plumber; a “jack-of-all-trades” who enjoyed repairing, renovating and remodeling. He and Lois would often finish a DIY project with a high-five. Ronald was loving and melted hearts, as he did Lois’ with his baby blue eyes. It didn’t take long for their courtship to turn into a marriage that spanned 58 unforgettable years. Ronald was caring and personable. He could strike up a conversation with anyone, hence earning him the nickname, “the Mayor.” As the saying goes, “Some people come into our lives and quickly go. Some stay for a while, leave footprints on our hearts, and we are never, ever the same.” Ronald was a true testament to this. His caring nature and grateful heart, often demonstrated by his “gentle, loving squeeze of your hand to say thank you,” touched many lives. Ronald was the chef of the family and showed his love by sharing meals with loved ones. He especially enjoyed handing out sweets to his grandchildren. Ronald was known for his “PopPop-isms.” He was full of joy and had an infectious, belly laugh! He was the man you’d call with any question, especially pertaining to the weather. He loved to share his secrets of how to find a bargain or clip coupons. Ronald enjoyed spending time at his residence in Vermont. He loved to open up his home to enjoy the company of his late mom, aunts, uncles, brothers, sisters, cousins, children, grandchildren and friends. He enjoyed fishing in the ponds and driving the dirt roads, with his family, looking for deer. The nights would usually end with a fiercely, competitive game of cards. Ronald was a devoted and lifelong fan of the Boston Red Sox and the New England Patriots. Ronald was the devoted husband for 58 years of Lois Ann (Queeney) Palmer, his true love and best friend. Ronald’s legacy lives on through his pride and joy, his children and grandchildren. Ronald was the devoted father of Ronald (Ann Marie) Palmer, of Black River, Cindy (Frederick) Lanou, of Clifton Park, Lisa (Ken) Blizzard, of Gansevoort, Michael Roy (Rachel) Palmer, of Niskayuna. “Pop-Pop” will be forever remembered by his 10 cherished grandchildren Michael, Jordan, Ben, Angeliah, Eric, Kate, Ryan, Sammy, Annie and LillyAnn; dear brother of Richard Stefanazzi, of Latham, Phyllis Cardiello, of Florida, Norma Baisden, of Watervliet, Priscilla Ottati, of Schenectady, Shirley Spada, of Clifton Park, Beverly Piotrowski, of Connecticut, Donald Palmer, of Michigan, Alton Palmer, of Florida, and the late Robert Palmer and Dorothy Jaskolka; devoted uncle to several nieces and nephews. Dad, PopPop, you are gone, but not forgotten. We will hold you forever in our hearts. We have been so blessed to have been loved by you. You are our hero. We will not say goodbye, we will say, “See you later!” Heaven has gained an angel. A funeral service for Ronald will be held on his birthday, April 2, 2019, at 10 a.m. in the Bowen & Parker Bros. Funeral Home, 97 Old Loudon Road, Latham, where Deacon Richard Thiesen will officiate. The Rite of Committal and burial, with Navy honors, will be held in the Albany Rural Cemetery, Menands. Friends are invited to attend and may also visit with Ronald’s family on Monday, April 1, 2019, from 4 until 8 p.m. at the funeral home. Contributions in his memory may be made to the Community Hospice Foundation, 310 South Manning Blvd, Albany, NY 12208. Visit www.bowenandparkerbros.com to leave a sympathy message and for driving directions.